Stop the execution of Troy Davis—an innocent man! 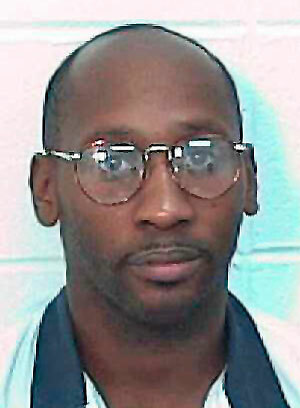 TOP: Troy Davis. BOTTOM: Rally organized by Students Against Mass Incarceration at Howard University, Sept 16. ANSWER organizer and Howard student Eugene Puryear addresses the protesters. The Georgia Board of Pardons and Paroles announced today that they have denied clemency to Troy Davis, who was wrongly convicted of killing a police officer in 1989. Davis is scheduled to be executed this Wednesday, Sept. 21, in the state of Georgia. The Board's decision is outrageous but not surprising. It reflects the same deep-rooted racism that prevailed throughout Davis' trial and legal appeals through the years. Of the nine witnesses, seven have recanted or altered their version of events. Five have signed statements saying they were coerced by police to testify against Davis, a common element of many racist “legal lynchings” targeting working-class people of color. Three witnesses said that another man, Redd Coles, confessed to them that he killed the police officer. 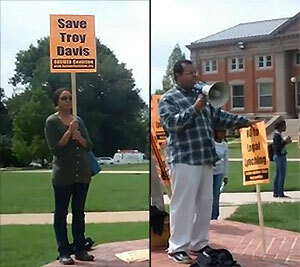 Opposition to Troy Davis's execution has been growing worldwide. On Sept. 16, coordinated protests took place in cities all over the United States and the world, including throughout the state of Georgia, in Washington, D.C. and elsewhere. The day prior, 650,000 signatures in support of Troy Davis were delivered to the parole board. Now, over 1 million people have signed petitions in his support. Prominent signers include South African Archbishop Desmond Tutu, former President Jimmy Carter, more than four dozen Members of Congress, and many celebrities. The decision to deny clemency to Davis reaffirms the unabashed racism and bankruptcy of the justice system. It is time to stay on the streets to demand justice! Stop the execution of Troy Davis! End the racist death penalty!